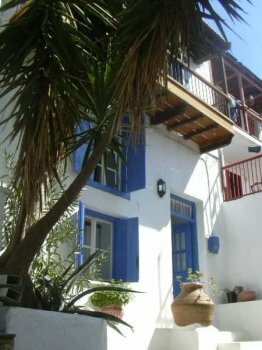 Situated in Skopelos town, this traditional house is full of original features. First floor: double bedroom with ample cupboard space. Second floor: large living room. Sunny balcony plus shady courtyard. Ground floor: kitchen off of which is the WC/shower room. Skopelos Holidays combines the protection of a UK-booked, tailor-made holiday with local year round representation on the island.